China is still an undeniably attractive place to have some investment exposure even if they do not always play nice. I have a hard time buying individual stocks because of trust issues. The KraneShares CSI China Internet ETF appears to be the best ETF for buying into Chinese tech growth. I am buying a starter position in the fund today. Long-term, we need some China exposure. It is one of the fastest growing economies in the world and will be for a long time. Despite the current trade tensions, the ultimate outcome will eventually be trade deals better for all sides – even if that takes two or three years. I am hesitant to buy individual company stocks due to trust issues with the Chinese government. 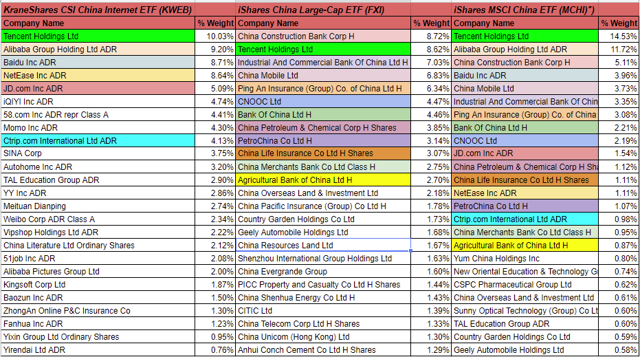 Thus, I am going to start scaling into a China position with an ETF, the KraneShares CSI China Internet ETF (KWEB). Things could get worse before better, so bite off easy to chew pieces. The KraneShares CSI China Internet ETF has been the best performing China ETF since it inception nearly five years ago. While many of the stocks ran up dramatically in the past couple years, the pullback has been just as dramatic, akin to America’s tech selloff in 2000. 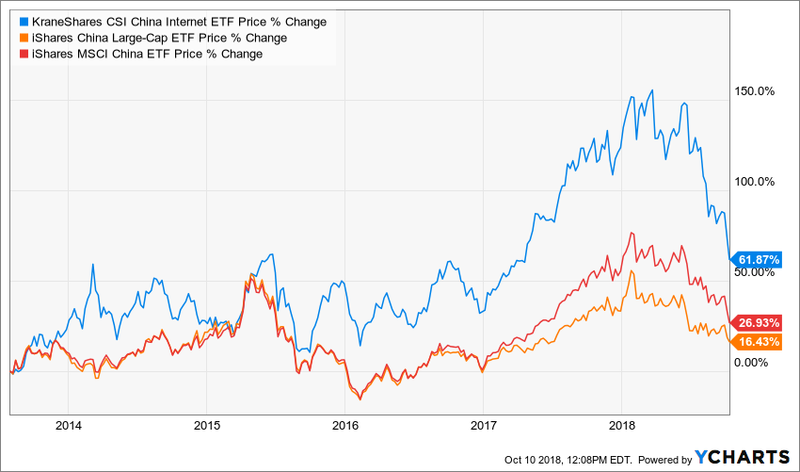 The three funds holdings are different with the China Internet ETF being almost all tech and the IShares China Large-Cap ETF being more traditional. The MCHI fund is a blend of tech and a more traditional asset allocation. 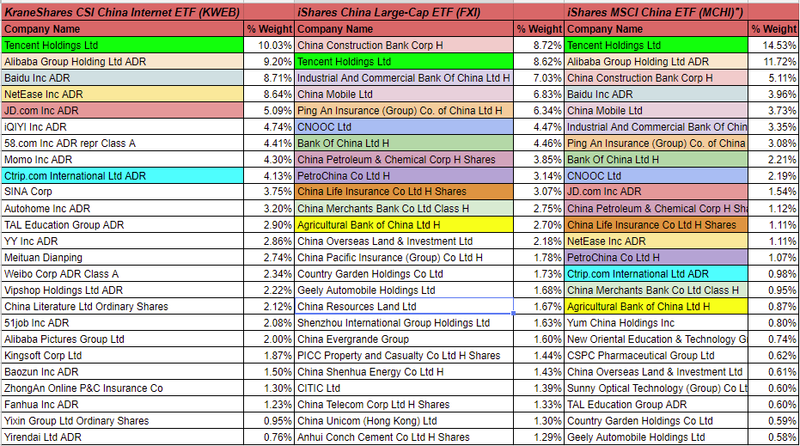 For more aggressive investors, I like the China Internet ETF. For those looking for more broad based exposure, I like the MSCI China ETF. 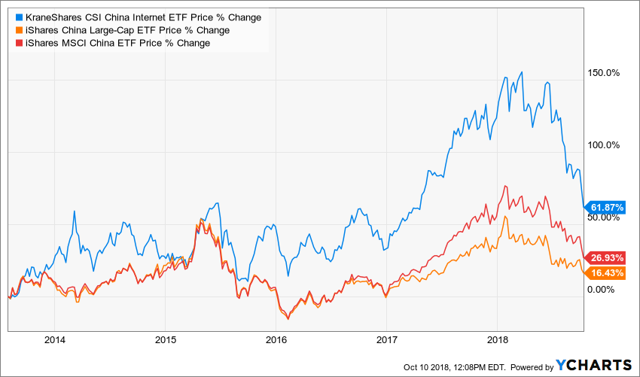 Compared to domestic American ETFs, compare the China Internet ETF to a fund like the First Trust Dow Jones Internet Index (FDN) and the MSCI China ETF to the SPDR S&P 500 ETF (SPY). There is a good support level for the CSI China Internet fund in the lower to middle $40s per share. If you believe in the growth story of the stocks, then this is a good time to start scaling in. 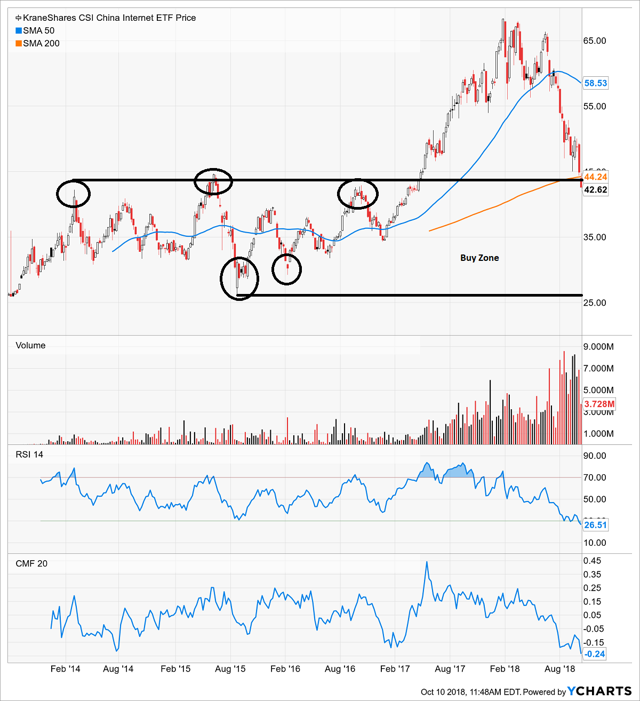 If you are purely looking for dirt cheap value priced growth, then waiting until the lower support levels would make sense. 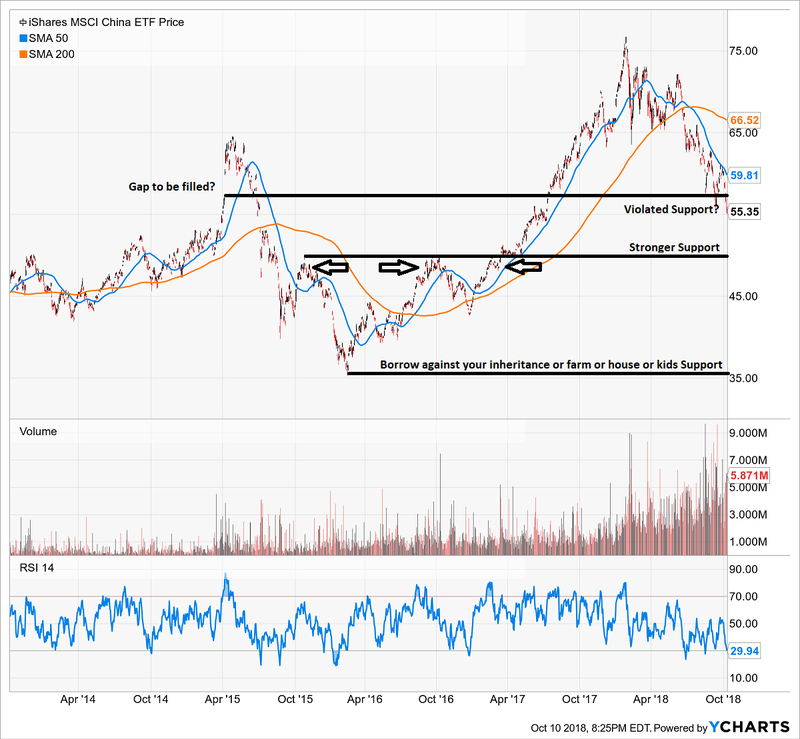 The older economy MSCI China ETF seems to have a bit lower to go if support stays violated at the end of the week. I am starting to build a position in KWEB. A small position to start which means about 2% of investable assets (vs 1.2% or 1% starting position when buying stocks). 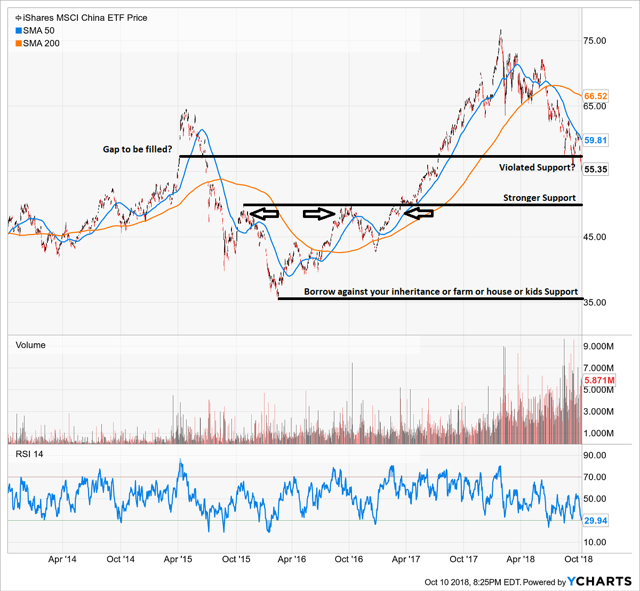 If the decline in Chinese stocks continues, I will follow up with a purchase of MCHI at about $50 per share. Disclosure: I am/we are long KWEB. Additional disclosure: I own a Registered Investment Advisor – Bluemound Asset Management, LLC – however, publish separately from that entity for self-directed investors. Any information, opinions, research or thoughts presented are not specific advice as I do not have full knowledge of your circumstances. All investors ought to take special care to consider risk, as all investments carry the potential for loss. Consulting an investment advisor might be in your best interest before proceeding on any trade or investment.